EmbroideryStudio e4 Decorating is the new standard for custom embroidery shops and apparel decorators expanding into embroidery. With a simple graphics digitizing approach, full control of lettering and stitch settings and over 200 professional embroidery fonts, you can produce your own commercial embroidery designs more quickly and easily than ever before. Get more quotes and jobs through your shop by creating and managing design digitizing requests with the new Order Job Feature. Quickly prepare design mock-ups on high resolution garment images and email .PDF approval sheets directly to customers. Use Auto-Digitizing to get accurate stitch estimates from customer artwork then save basic order and job production information right in the Wilcom .EMB design file for easy reference. Use the new integrated Design Library to find designs in seconds by customer, order, date and other text or parameters, all within the software. Apply your existing graphics design knowledge to digitize your own embroidery designs with the new graphics digitizing tools. 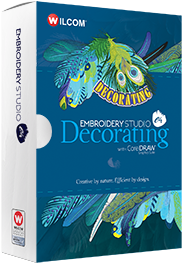 Compatible with all EmbroideryStudio e4 software products. Much faster handling and processing of very large designs. Virtual Decoration – Create high resolution embroidery TrueView images for digital printing. Vector Drawing – Create and edit vector graphics directly in Wilcom designs. Bling – Create and output bling designs for stones, rhinestones, beads and spangles. Auto-Digitize Bitmaps – One click converts bitmap graphics into embroidery. There are several brand new tools and features packed into the software as well as improvements to many of the existing professional tools. It also now includes 6 features which previously were additional add-on Elements that were available to buy separately. Fully integrated and bundled within the software. 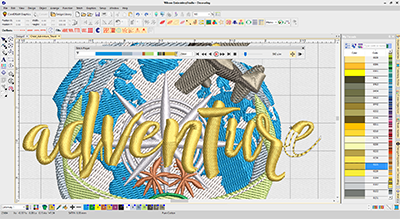 There are many new and improved Corel features specifically relevant to embroidery, multi-decoration, printing, cutting and engraving. It includes an extensive clip art and font library. Easy to install and Windows 10 compatible. Easier digitizing perfect for beginners yet with the full control over inputs for more advanced users. Create embroidered outlines and fills using the same shape tool. Convert outlines to/from fills in a single click with the new Stitch toolbar. Add or remove holes and stitch angles. Create drawing objects as vector outlines or fills in the same way. There are 6 new features included which were previously add-on Elements purchase separately. This includes Offsets Standard, Team Names Standard, Vector Drawing, Auto-Digitize Bitmaps, Bling, Kiosk Mode and Virtual Decoration. The software works with all major embroidery machine brands.